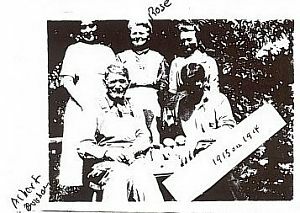 Rausie Ann (Rose) Pace was born December 06, 1861 in Clarinda, Iowa, and died June 20, 1939 in Paonia, Colorado. 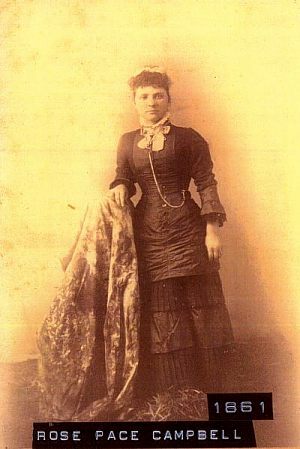 She married Albert Brisbane Campbell July 23, 1883 in Pitkin, Colorado. He was born August 30, 1843 in Zanesville, Ohio, and died March 26, 1914 in Paonia, Colorado. Albert Blaine Campbell, born September 06, 1884 in Paonia, Colorado; died January 02, 1964 in Louisville, Kentucky. He married Bernice Cloe Livsey in Paonia, Colorado; born February 04, 1880 in Girard, Kansas; died March 11, 1957 in Paonia, Colorado. The photo at left is presented as received with the labels attached. 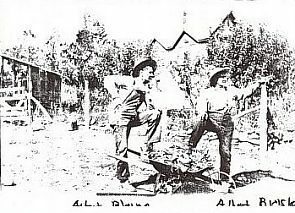 Note that "1861" is not the date of the photo, but the year of Rose's birth. The photo was probably taken about 1880. 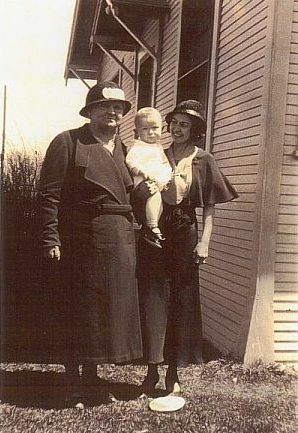 Rose Pace Campbell, granddaughter Roberta Richardson Campbell, and Roberta's son Albert Beryl (Bud) Campbell, Jr., photo about 1930. 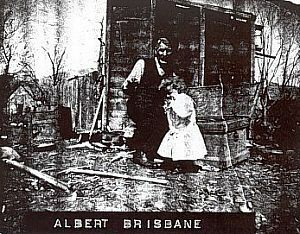 These three xerox copies of photos of Albert Brisbane Campbell and various members of his family are only known as labeled. A number of the individuals have not as yet been identified. The labels on the bottom right photo are Albert Blaine and Albert Brisbane.